The place to post your inquiries and tips about the unquestionably manliest and most exciting facet of the game. Most of you know my situation at this point. I take a 16 pace run up and bowl wide off the crease. Recently I've been trying the javelin thrower thing and also cocking my wrist like Steyn to increase pace. I still have to consciousy make an effort to do it but I'm seeing positive results (a 6th grader said I was too fast for him he other day ). I need to improve my stamina though. Cant get through more than an over at full pace at a time. Plus every over I seem to bowl one unforgivable pie. I try to copy Croft when coming around the wicket. Wide of the crease, trying to get that lefty angle. Only tried one over with that so far. 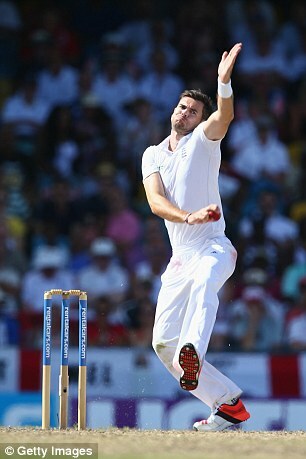 Am I wrong in suggesting James Anderson has a lovely action for those interested in the side on approach to fast bowling? Last edited by andruid; 18-10-2018 at 02:37 AM. Yes. He isn't very side on. Look how open his hips are at that point, looking inside the arm. You want real side-on, try someone like Fred Trueman. Plus I wouldn't copy his head dip. It works for him but may not work for other people. I've been copying Larwood for a bit now. It's a strain on the back at first but it works. I occasionally bowl too many wides down leg side that way though. Last edited by NotMcKenzie; 19-10-2018 at 05:33 PM. Starfighter and trundler like this. If I used foul language, it was most probably suitable to the circumstances. The BBL is like an un-flushable turd. No matter how many times you flush, it just keeps whirling & whirling around the bowl. Anderson is a classic case of a mixed action. Coaches usually won't teach this because of high risk of injury, but it's certainly very effective and lots of players have had success bowling with mixed actions. This is a comment that I made in Days of Grace's 100 Best Bowlers thread about mixed actions. And no, there aren't many bowlers who've had really long term success with such an action. There's a difference between 'mid-way' and mixed. Mixed is the one with the twisting. Most people think of closing the shoulders much more than the hips in the gather, but the sort that you'll see on a lot on injury prone bowlers is actually the other direction, with the hips more closed than the shoulders upon back foot contact. Almost all truly fast bowlers separate their hips and shoulders which open up earlier than the shoulders, when this happens with a hips-closed, shoulders-open bowler the shoulders will rotate a significant distance backwards with respect to the hips, this is the counter-rotation that causes the injuries. Ian Bishop is a very clear example of this. Mid-way simply means that the hip and shoulder angle at back foot contact, provided they are close, is somewhere around 45° with respect to the crease, rather than closer to parallel or perpendicular (chest-on and side-on respectively). Dan, Daemon, zorax and 1 others like this. Impossible to have long term success of you're always getting injured. But there isn't something inherently wrong in bowling with a mixed action outside of that injury risk. Last edited by smalishah84; 19-10-2018 at 08:33 PM. Stick to finger spin mate... As I said I can barely get through an over, don't think a risky action is a good idea. Side on works best for me though as I said, it's a strain on the back. My natural action is more Nuwan Kulasekara though so I have to still actively 'twist' in my delivery stride. I like the angle that gives me too. Last edited by trundler; 19-10-2018 at 09:41 PM. 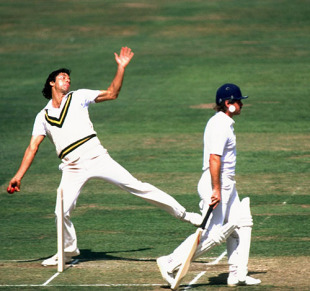 Might be a bit obvious, but Hadlee had a wonderfully aesthetic action. Not as side on as some of those mentioned but he still retained great control over the ball's movement. Edit: Jeff Thomson might be king for side-on actions. Last edited by andmark; 20-10-2018 at 05:59 AM.